Ford redesigned its Super Duty lineup of trucks for the 2017 model year and the recipe is familiar. Like the best-selling, light-duty F-150, heavy-duty models have got the high-tensile chassis and aluminum made body. The Super-League models have also the same cabin as the F-150 and the styling is somewhat more aggressive. The redesigned trucks are also smarter and better-connected thanks to the new tech features but the safety is also guaranteed with many cameras and active driver aids. So, after such thorough redesign, the 2018 Ford Super Duty is not expected to bring any significant change. Ford could make some changes in the equipment organization but mechanically and design wise, the model will continue unchanged. In order to improve the capability of the Super-Duty trucks, Ford constructed the chassis from 95% high-strength steel which radically improves the strength and rigidity of the structure. Ford claims that new frame design is 24 times stiffer than on the previous generation. The fully-boxed frame has larger crossmembers while the driveline elements like the axles, brakes, drive shafts and 4WD transfer case were strengthened as well. Ford also uses an aluminum for the body panels and redesigned models weight up to 350 lbs less than the previous generation models. Ford also made some notable changes to the styling of the fourth generation Super-Duty models and the 2018 Ford Super Duty will continue unchanged in that aspect as well. The new trucks have more macho look defined with the two-bar grille design, C-shaped headlights and clean body lines. More or less chrome will shine depending on the trim level and each trim will further be distinguished with the specific finishes, wheel design and size, and so on. Inside the cabin, Super-duty models are more spacious than the previous generation and the automaker actually uses the same body shell as on the F-150. New cabins are comfortable and built with the high-quality and durable materials. The level of the comfort and tech features depend on the trim level and cabin style and your truck can be very comfortable and smart thanks to available features. Some of the tech features include the Sync3 infotainment system with 8-inch center display, surround view cameras, adaptive cruise control, blind-spot monitoring with rear cross-traffic alert, lane departure warning and interventions, etc. The truck can also be had with the multi-contour heated and ventilated seats, full leather upholstery, dual-zone climate control, power seats and pedals, driver memory setting, premium sound system and so on. The trim levels will include XL, XLT, mid-range Lariat, King Ranch and top-of-the-line Platinum options. The available cab styles are the regular, extended and crew-cab variant. The F-350 model offers either the single- or dual rear wheel configuration. The F-450 comes only with the dual rear wheel setup and four-wheel drive. This version is also available in crew-cab and 8-foot bed version only. A 6-75-foot bed is also available with the F-250 and F350. Most of the 2018 Ford Super Duty models will have the base 6.2-liter gasoline V-8 engine. This engine benefits from the last year improvements and can provide 385 hp and torque of 430 pound-feet. Ford also upgraded the 6.7-liter turbodiesel V-8 engine for the recent redesign. This engine now delivers unmatched 925 lb-ft of torque and number of ponies is at 445. The transmission system is the TorqShift six-speed automatic on the F-250. Other versions include the 6R140 six-speed automatic. The F-250 can tow up to 18, 600 pounds and the payload maximum is 4, 200 pounds. 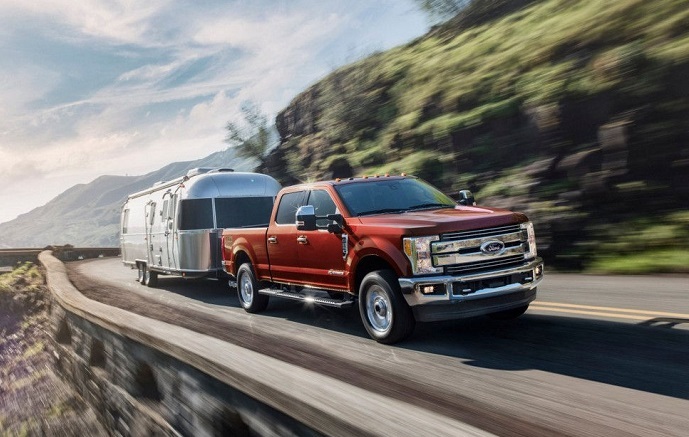 The payload maximum of the F-350 is 7, 630 while the towing limit is the class-best 32, 000 pounds. The F-450 is limited to 32, 500 pounds. With no significant changes, the price of the 2018 Ford Super Duty models should not also change much. The Super Duty models will be available from around $34, 000 but price will climb high with additional equipment. The F-450 should start from around $55, 000. Thank you for the 2018 Super Duty information. One item I didn’t see is an option for air suspension. Is this something that Ford has omitted for a reason? Are factory airbags not suitable? I ask, because I am concerned that if I purchase a new F450 for towing my large (45′) Toy Hauler, I will have to also invest in aftermarket suspension…Thoughts or insight into Ford’s lack of air suspension for their Super Duty please.